The very first MS that appears in Gundam Build Divers is the trusty AEUG mobile suit Rick Dias, done up in the colors of its successor Rick Dias II from Zeta Gundam’s MSV design series. This unit has been customized to mount both of its beam pistols onto its forearm. This civilian-use mobile suit from the Cosmic Era universe makes its anime debut customized with gear typically used by the GM Command from Gundam 0080, even sporting an Earth Federation crest prominently on its shield. Another CE mobile suit given UC flair. This Buster Gundam takes its color scheme from the Heavy Gundam, a heavily armed variation on the RX-78 Gundam from the 1984 MS-X mobile suit variation design series. Gundam X plays out as a kind of apocalyptic “what-if” scenario on the original Gundam anime’s One Year War, complete with stand-ins for many of the mobile suits from that show. The Daughtress line functions as the GM stand-in; here the New United Nations Earth’s Daughtress Neo sports the color scheme of its pre-apocalyptic predecessor. A quick equipment cameo, the 7th Panzer Division employs wire triggers to explosives reminiscent of the time bombs used by Zeon commandos during the original Mobile Suit Gundam. While the Geara Doga isn’t so much off the beaten path, its color scheme and white accent on its head suggests the high-spec custom Hi-Zack Vanargand from the first Advance of Zeta sequel. Here in its anime debut, Zaku Minelayer does just what it says on the tin. As far as variations go it’s fairly minimal: just a vanilla Zaku II with a backpack to store mines and extra fuel. The 7th Panzer Division’s unit has also equipped the R-Jarja’s (Gundam ZZ) unique beam rifle as well as what looks like the Big Gun (yes, really) normally equipped on a Zaku Cannon (MSV). Rommel is sure to be a recurring character and this won’t be the last time we see his Grimoire Red Beret either. The previous Build Fighters series have found ways to sneak in references to other past Sunrise mecha anime besides Gundam, and Divers is putting one right up front. The Red Beret is a clear reference to the scrappy, disposable Scopedog of Armored Trooper VOTOMS fame, down to its wheels and the signature markings of the elite special forces Red Shoulder Battalion. This customized take on the experimental Zudah may as well just be called the Zudah Sniper Type. It trades in its signature unstable, high-speed thruster for the Zaku I Sniper’s backpack that normally powers a sniper rifle it doesn’t seem to have. Instead, this Zudah uses the Big Gun (yes, really, but this is a different one) used by the Living Dead Division’s snipers from Gundam Thunderbolt. Earth’s economic blocks weren’t enough; Gjallarhorn has to dominate the food court as well. The unconventional looking Woundwort has long been a favorite for fans of the Advance of Zeta series of novels. This isn’t its first appearance in the Build Fighters franchise either; it actually appeared in battle in the final episode of Build Fighters Try due to it being a finalist in a fan cameo poll. The origins of the popular MUSHA Gundam variations are actually as customized battling models in the manga that serves as the prototype for the whole Build Fighter concept: Plamo-Kyoshiro. Since then they are largely known for their SD incarnations in the Sengokuden line of the SD Gundam franchise, but the one that appears here is the real-proportioned Master Grade model. The elusive Diaochan Qubeley from SD Gundam Sangokuden cameos just in time for the show’s 10th anniversary and the model’s wide re-release. Previously the only way to get this model was to get the $300+ Japanese Blu-ray set of Sangokuden, but now fans no longer need to break the bank! Oh, you aren’t familiar with SD Gundam’s take on Romance of the Three Kingdoms? Believe it or not, the whole series actually streamed for a time (dubbed in English!) 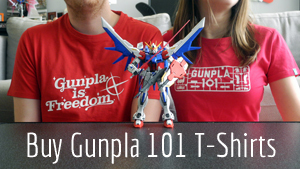 on GundamInfo’s official YouTube channel before being unceremoniously taken down a year or so ago. Almost as quickly as she appears, Diaochan Qubeley is chased off screen by the Gundam Double X’s support craft G-Falcon, Gundam X’s analog to the original series’ G-Fighter. Another animation debut for a Destiny Astray mobile suit and a fan favorite. The Testament Gundam is actually supposed to shift to this red color when at close range, which begs the question: is there actually color changing Phase Shift paint in the world of Build Divers? The Earth of Gunpla Battle Nexus appears to be based on the one from the Universal Century, what with Australia missing a big chunk. The Gundam Base has theatrical posters for Mobile Suit Gundam III: Encounters in Space and Char’s Counterattack, as well as an ad for a DVD release of the anthology series Gundam Evolve. There are a number of cosplayers and cameos in the GBN lobby, but this player really stands out wearing the Zudah pilot’s unmistakable red uniform. This is easily one of the deeper cuts the Build Fighters franchise has gone for. These soft, clay-like Gundam and Zaku characters are from the uniquely charming “Genesis: Pikilienta Pohles” from SD Gundam Mk. V. The short consists of a series of vignettes showcasing the antics of prehistoric tribes of vaguely mobile suit-shaped creatures going about their lives. GBN’s lobby NPCs are identical to the ones worn by the staff of the Super Dimensional Guard’s (SDG) Blanc Base from the show that, for better or worse, introduced SD Gundam to the western television audiences: Superior Defender Gundam Force. About Tom: Gundam diehard for most of his life at this point. Amateur archivist seeking out weird forgotten robot stuff when he can. You can also find him on Twitter.